This entry was posted on April 5, 2019 by thecladdaghblog. 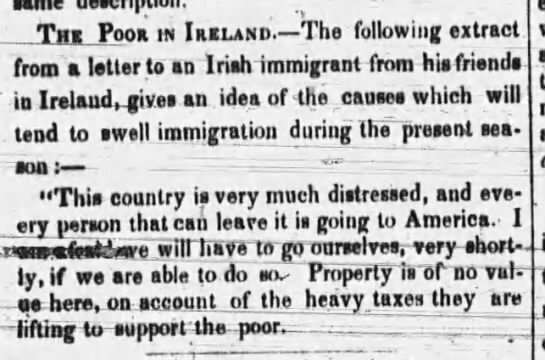 The 1840's in Ireland was a time of survival, sorrow and torment. 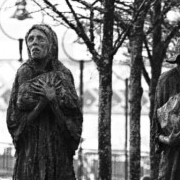 The unbearable oppression that the Irish suffered under English control contributed heavily to the huge amount of deaths during the Irish famine. Afraid that the Irish would become dependent on state aid they ordered the closure of soup kitchens and added further to the sufferings of the impoverished people of Ireland. They laid the burden upon the landlords and introduced a poor tax to cover the cost to the English nation. Consequently, more English soldiers were deployed to Ireland to shield food goods that were been deported to other countries and to minimize disharmony among a ravenous people. Over 1 million people perished and another 2.5 million immigrated. 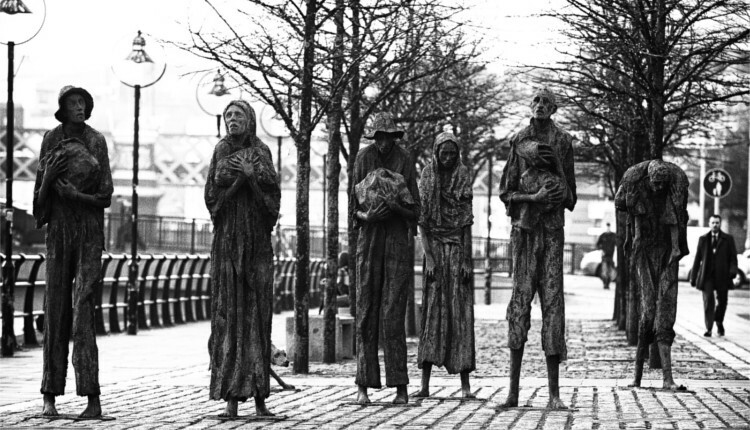 At the time, the under-privileged Irish lived on potatoes with no access to any other food source – since the cost of food was out of reach. A fungus infected their crops leaving them without food, money and it left a considerable amount without a home due to mass evictions. An ample portion of Ireland was devout Catholic in the 1840's. Landlords were now challenged with issues relating to conscience. While many of them are illustrated as been greedy and money hungry, a sizable amount were good people and did not add to the sufferings of their tenants. On the other side, there was landlords who did not care about their land and used heavy handed middle men to manage their estates and to collect any money owed from rent. A landlord was more often considered wealthy but with starving tenants unable to pay their rents and with a new poor tax to pay for each tenant, landlords were quickly loosing money from their land. 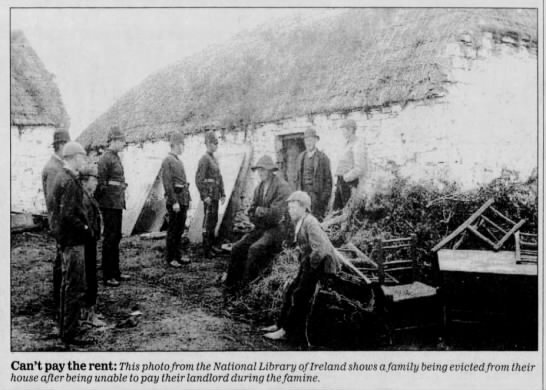 Landlords felt the burden of holding a huge responsibility and many of them became bankrupt and poor themselves, refusing to evict the poor suffering souls who occupied their land. Others evicted tenants once they felt their resources had largely depleted and they believed they had no other choice. For many, landlords became opportunistic, not wanting to ruin their lavish lifestyles with the burden of the poor. They cruelly evicted tenants and burnt their homes to make sure they did not try to re occupy the land. 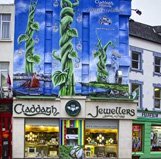 Hungry, oppressed and now homeless, the Irish turned on the greedy landlords in revenge. Starving peasants began to conspire against the rogue landlords and sought revenge in atonement for their greed. The small network of 'brotherhood' groups set up and a murderous vendetta against those who left them without a home. Frightened by the groups, landlords began to flee to England to take refuge from the dangers. The most famous case of a murdered landlord was Dennis Mahon. Dennis Mahon owned Stokestown house in Co. Roscommon. He forcefully evicted thousands of tenants from his land to ensure that his extravagant lifestyle was maintained through the plight. He promised the tenants he would pay 26000 pounds to send them to the United States. However, when it came to pay he decided to only pay a few thousand pounds for the cheapest way to Canada. A death wish for many travellers with only half leaving the ships alive. While not totally heartless, he would leave half a thatched roof for the family's to huddle under in a ditch. The descendants of Dennis have since doubled the size of his estate. He was shot in the head as he was driving near his home in Co. Roscommon. Bon fires were lit on his land near his home an hour later – a warning for many. His death became a major scandal in England and many other landlords fled to avoid the same fate. Four more landlords were slain by vengeful peasants in the following months. Later, two men were hanged in connection to Dennis Mahons death. The plight of the Irish over 500 years ago has been well documented. To this day there are many movies and art sculptors that reveal the nature of their hardships and torments. The oppression which the people endured would be unthinkable in today's Ireland, where the majority of people live with plentiful of everything. While our ancestors suffered so much we continue to remember them and what our nation endured to have the freedom we do now.